Witness Lee offers a serious examination of the last great vision in the Bible, the New Jerusalem at the end of Revelation. The New Jerusalem is not a physical city but a symbol of an organic constitution of two parties: God and man. The first party is divine. The second party is human. This city is a great sign of how the Triune God is everything to His elect. 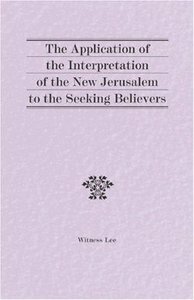 About "The Application of the Interpretation of the New Jerusalem to the Seeking Believers"
Lee, at the age of 19, began preaching. Early in his service, he met Watchman Nee and began to labor together with him. In 1949 he was sent by Watchman Nee to Taiwan. In 1962 he came to the United States and began to minister here. He ministered in weekly meetings and in weekend conferences, delivering several thousand spoken messages until 1997. He gave his last public conference in February 1997 at the age of 91.